I have vague memories of the Power Rangers from my early childhood — most saliently, the memory of my younger brother dressing up as the red Power Ranger every Halloween for five years straight. So when I heard that a remake, Saban’s Power Rangers, was coming out, I was excited to compare it to the original 1990s series. Power Rangers made a big impression on kids like me and my brother, and the 2017 remake did not disappoint. The Power Rangers are certainly not new to popular culture, as the show began as an American adaptation of the 1975 Japanese television series Super Sentai. The American version, which aired in 1993, filtered through several entertainment companies as the show gained huge popularity amongst American youth. Although Power Rangers drifted off of my radar in the early 2000s, the show has maintained a large fanbase to this day, with Nickelodeon airing its newest edition, Power Rangers Ninja Steel, just this year. The 2017 Saban’s Power Rangers follows a group of misfit teenagers, Trini Kwan (Becky G), Jason Scott (Dacre Montgomery), Kimberly Hart (Naomi Scott), Billy Cranston (RJ Cyler) and Zack Taylor (Ludi Lin), who meet in detention. Together, they discover a series of glowing stones on the outskirts of a gold mine which transform them into the Power Rangers. The previous owner of the stones calls upon the teens to train them for their newfound responsibility — defeating super villain Rita Repulsa (Elizabeth Banks). The Power Rangers cast included many familiar faces as well as a few new actors. Regulars to the big screen included Banks, Bryan Cranston (Zordon), Bill Hader (Alpha 5) and singer Becky G while some newbies are Montgomery, Scott, Cyler and Lin. Surprisingly, the majority of the newcomers had better acting chops than expected. Most notably, Cyler stands out as having the most potential for future big screen success. Cyler portrays Billy’s autism authentically without over-emphasizing his condition’s importance as a plot device, thereby creating a good role model for children with developmental disabilities. Scott, however, falls flat in portraying her character realistically, as her lines are often over-exaggerated or stilted. Of the more acclaimed actors, Banks portrays Repulsa in a laughable, cringeworthy and cliché manner. Repulsa’s desire to control the universe (yes, even her evil plan is overdone) has almost no contextualization, simply explaining that she turns completely evil after a newfound desire for power. Most notably, her dialogue is simplistic and overused; at one point she says something along the lines of “It’s time to kill everyone” as she walks into battle. Banks fails to breathe life into her character, making Repulsa entirely two-dimensional and unbelievable. The cast of Saban’s Power Rangers represented almost every race, socioeconomic background, sexual orientation and ability, making Saban’s Power Rangers one of few films that portray such diverse superheroes. The film portrays this diversity in such a subtle way that it succeeds in normalizing it, making it a non-issue, which is a feature that every future film should aspire to imitate. The action in Saban’s Power Rangers is on par with that of the Transformers and Marvel superhero movies. There are the quintessential training scenes, in which the Power Rangers prepare for the ultimate fight against Repulsa, and the adventures in which they discover and test their superpowers. The final fight scene, however, is the most action-packed, as the Rangers bring out their Zords, dinosaur-inspired, Transformer-like vehicles to battle Repulsa’s gigantic golden soldier. Adding to the modernized remake is a peppy soundtrack, which includes contemporary hits like Fitz and the Tantrums’ “Handclap.” The songs are applied well throughout the film, matching the excitement or suspense of each scene. The soundtrack consists of songs from many popular artists, like Kanye West, Twenty One Pilots and Tove Lo, making the film especially engaging for teenagers and young adults. I enjoyed Saban’s Power Rangers and foresee this becoming a major feature film franchise, spawning several sequels as the Power Rangers battle new villains. Saban’s Power Rangers is the new Transformers; it has the same family-oriented, fun action and light comedy as the successful yet dwindling Transformers series. 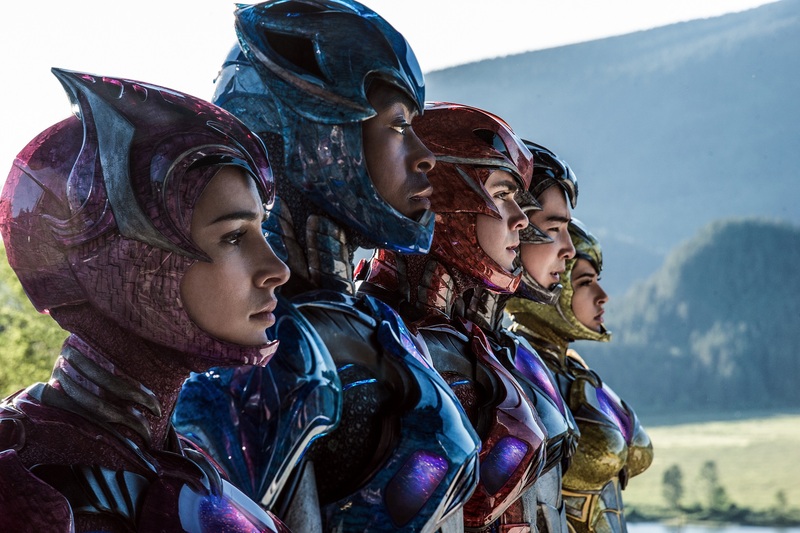 Saban’s Power Rangers was a truthful, and yet progressive, rendition of the original series, and gleefully transported its older viewers back to their childhoods of imaginative adventure.